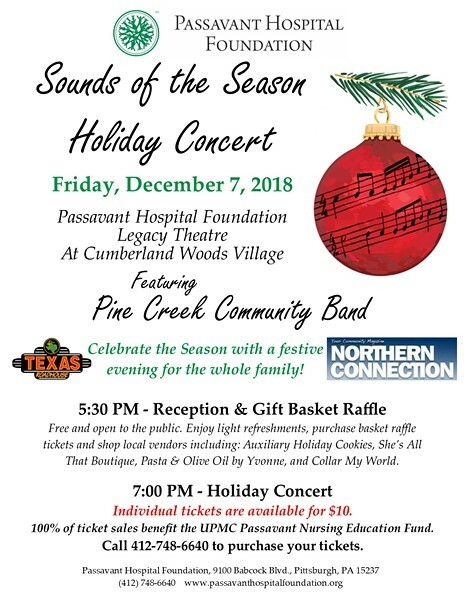 Join the UPMC Passavant Hospital Foundation on Friday, December 7, 2018 at the Passavant Hospital Foundation Legacy Theatre at Cumberland Woods Village for the Sounds of Season Holiday Concert. The holiday concert will feature the Pine Creek Community Band. Celebrate the Season with a festive evening for the whole family! There will be a Reception and Gift Basket Raffle starting at 5:30 p.m. The Holiday Concert will begin at 7:00 p.m. Tickets are sold individually for $10 and 100% of ticket sales will benefit the UPMC Passavant Hospital Nursing Education Fund. To purchase tickets, call 412-748-6640.